As the leaves have fallen off, the green wall of oak–hickory forest behind my house has given way to glimpses of mountains and valleys to the south and west. With the lush green of summer and the brilliant fall colors now a memory, any spot of green left tends to beckon me when I walk back there. The slope is dry, and the soil poor. Other than a few spunky baby pines waiting for the deciduous trees around them to keel over and let in more light, there is little relief from the sea of browns and grays of this bare oak–hickory forest this time of year. Most water drains off so fast that moisture is retained only in few spots where underlying rock has tumbled or worn in such a way as to slow the downhill progress of water and organic detritus, creating pockets of richer, moister soil than on the rest of the slope. 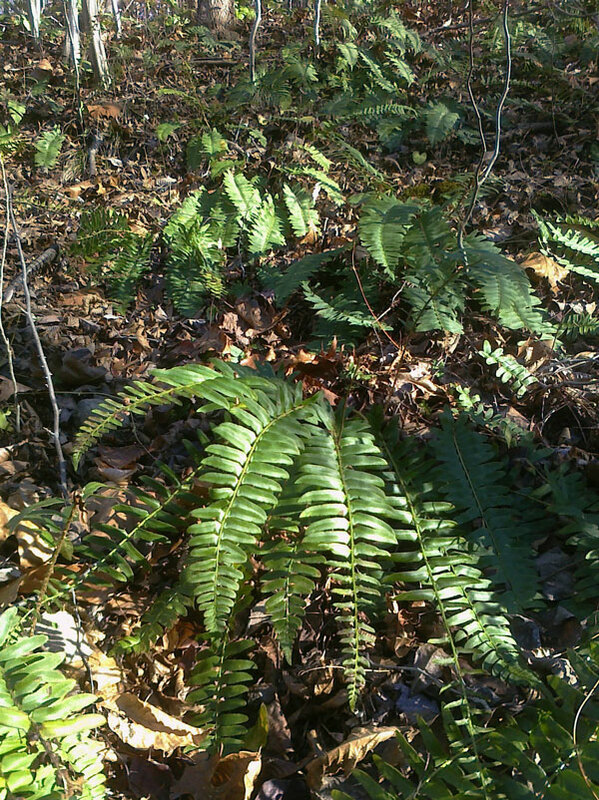 In one of those spots, an understory evergreen common to the region—Polystichum acrostichoides, known commonly as the Christmas fern—has sprouted here and there. According to some sources, its name came from the early colonists’ using it as a Christmas decoration. Also known as the dagger fern because of the knife-like shape of its sturdy pinna (the leafy parts) and hilt on the stem end, this is no delicate plant. If it were, it wouldn’t stay green through winter. 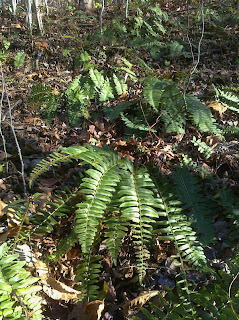 In walking recently on a friend’s property along the Rappahannock River, where the soil is much richer and wetter than in my woods, I enjoyed the lush abundance of Christmas ferns there. With the recent cold snap, some of these had hunkered down, appearing more prostrate than their usual perky selves but still showing remarkable resilience compared with the mostly brown understory around them. Despite its daggerlike pinna, it leant a soft, lush look to the landscape. Although I’ve never thought of using this fern as a holiday decoration, I do have fond memories of going out with my brother into the “wilderness” near our house in the Town of Fairfax when I was six or seven to collect other greenery for that purpose. This included “crow’s foot” (Lycopodium digitatum), a vining, ground-hugging evergreen whose foliage resembles the foot of a crow, although with more and softer digits. It’s also known as fan clubmoss, ground cedar or running cedar. I loved that plant and its association with Christmas, looking for it in vain on my hikes around Virginia in later years. spotted wintergreen (Chimaphila maculate, center). crow’s foot, which carry the plant’s spores. As kids, we considered all land not turned into subdivision as ours to roam and plunder, not thinking that anyone would care. As an adult I realize that, not only were we trespassing and stealing, we were also loving nature to death by bringing it home—from animals to plants to stones. Even then, collectors had admired crow’s foot and other clubmosses almost to extinction—to the point where they had to be protected by law. Clubmosses, plants in the genus Lycopodium (Greek for “wolf’s foot”) are delicate-looking, low-growing evergreens that carpet forests, especially those with rich soil. They are considered fern “allies” in that they share a sexual reproductive strategy that involves shedding spores to initiate metagenesis—alternating generations that have different growth phases that are actually two distinct organisms. 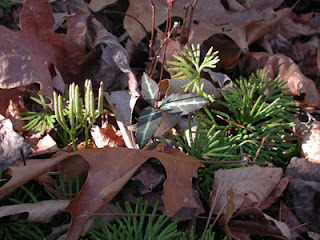 Fortunately, because of conservation efforts, many plants in the Lycopodium genus are now rebounding, and I’ve had the joy of seeing crow’s foot, along with two cousins, Lycopodium clavatum (princess pine) and Lycopodium obscurum (ground pine), growing in Rappahannock County since I moved here eleven years ago. No Lycopodium is currently on DCR’s lists of vascular plants of concern. However, some similar-looking plants that are also called clubmosses but that have been reclassified as belonging to other genera are on those lists. In general, if you are interested in collecting a wild plant on your property, it’s a good idea to find out whether it’s protected before you whip out your shears or trowel. Contact DCR if you’re not sure, but it’s always best to stick to plants that are abundant if you do want to use some for holiday decorations. If you really want to do our native plants a favor, whack away at oriental bittersweet (not the native). It has lovely berries; just don’t put them back out where they can take root. 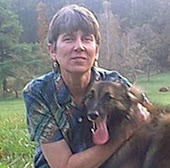 A writer, photographer, Virginia Master Naturalist, and lifelong conservationist, I love nature, good books, great food, anything that makes me laugh, my dog, a steady income (whatever that is), and dirty martinis. I live in the Blue Ridge Mountains on the border of Shenandoah National Park and can't think of any other place I'd rather be. Learn more about me and my work at my company's website, Nighthawk Communications. Click above to find out about the "Wild Ideas" syndicated newspaper column and to see samples. All photos listed as Pam Owen's are licensed under the Creative Commons Attribution-NonCommercial-ShareAlike 3.0 Unported License. All other graphics and text © 2014 Pam Owen. For more information and usage permission, please e-mail Pam Owen.